Choosing a tyre for your 4x4 has never been easier; follow the guides below to find out the basics of finding your tyre size and what 4x4 tyre is best for you. With the new EU tyre labelling choosing a tyre is simpler than ever. How to find my 4x4 tyre size. What is EU Tyre Labelling? What 4x4 tyre is best for me? My tyre is not listed. You can find your tyre size moulded into the side wall of your tyre, sometimes the tyre size can also be found in the owner’s handbook however we always recommend to check the tyres that are fitted to the vehicle as this could have easily been changed. It's important to check both front and rear tyres as sizes can be different. The tyre size specifies the dimensions of the tyre. Tyre sizes have grown in complexity over the years; there are two types of tyre measurements and codes that could be moulded on your tyre side wall. Most tyres sizes are given using the Metric sizing system which is measured in millimetres, however the Imperial sizing system is also often used which is measured in inches. It is actually very simple, please see the breakdown below which indicate both imperial and metric tyre sizes and what they mean. Metric tyre sizes are measured by millimetres (mm). Width - The width of the tyre in millimetres. Profile - The height of the tyre sidewall as a percentage of the tyre width. Rim Size - The diameter of the tyres inner rim, in inches. Speed Rating - The maximum recommended speed for the tyre at full load. Imperial tyre sizes are measured in inches and are often found on off road vehicles. Diameter - The overall diameter of the tyre in inches. Width - The height of the tyre sidewall as a percentage of the tyre width. Tyres are specified by the manufacturer with a maximum load rating. Loads exceeding the rating can result in unsafe conditions that can lead to steering instability and even a puncture. The tyre load rating indicates the maximum weight each tyre is able to carry. The load rating of a tyre is usually found after the diameter reading and before the speed rating on the sidewall marking. The table below shows the weight capacity in kilograms of each load rating. The speed rating denotes the maximum speed at which a tyre is designed to be operated. These ratings range from 100 to 200 mph (160 to 300 km/h). The speed rating of a tyre is indicated by a letter at the end of the tyre size on the sidewall of the tyre usually next to the load index. For example a tyre with a speed rating of "S" can reach speeds of up to 112mph. A tyre's speed rating is the result of specific tests ran by engineers. These involve running the tyre at 6.2mph steps in ten minute increments until the required speed has been met. If your vehicle is fitted with a 4x4 tyre with a lower speed rating than is appropriate for your vehicle you could invalidate your insurance, therefore it is essential you check your vehicles speed rating before purchasing new tyres. The table below shows the maximum speed in mph & km/h of each speed rating letter. 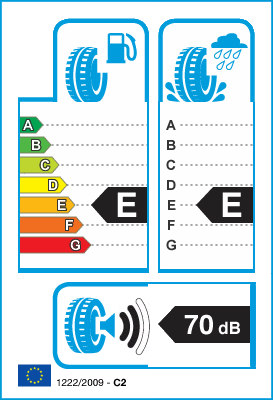 New European regulations passed on 1st November 2012 states all tyres must be labelled on their performance on wet roads, fuel economy, rolling distance and road noise. The new tyre labels are very easy to read, they have the same colour coding letter rating system as white goods i.e. washing machines and fridges. Tyres are rated on a scale of A-G, A being the best. This is great news for consumers as you can now make an informed choice through performance rating. New regulations around tyre performance labelling helps you make an informed tyre choice, it's never been easier! When should I replace my 4x4 tyres? Tread depth must be no less than 1.6mm and all drivers must know how to check their tyres correctly. It is illegal to drive if your tread depth is less than 1.6mm and you could receive a fine and penalty points. Checking tread depth is easy. You can use a 20p coin as the rim of it measures 1.6mm. Place the coin inside the tread groove and if the tyre covers the coins outer rim, your tread is ok.
For a more accurate reading, you could invest in a tyre depth gauge. What tyre is best for me? The All Season tire classification is a compromise between use on dry and wet roads. The type of rubber and the tread pattern best suited for use under summer conditions cannot, for technical reasons, give good performance on snow and ice. The all-season tyre is designed much for day to day road use. All terrain tyres are typically used on Pickups, SUVs and light comercial vehicles. These tyres often have stronger sidewalls for greater resistance against puncture when traveling off-road, the tread pattern offers wider spacing than all season tires to remove mud from the tread. Many tyres in the all terrain category are designed primarily for on-road use but if you wish to venture off track the tyres will be man enough for the job. Mud terrain tyres are typically used on off-road 4x4 vehicles, they have a much larger spacing than all terrain tyres in the tread of the tyre to grip on difficult terrains like mud, snow and sand. When used on a the road surface mud terrain tyres can be significantly loader and wear much faster on road compared to an all season or all terrain tyre. My 4x4 tyre is not listed. Your tyre size is specifically required when ordering 4x4 tyres with RoughTrax, if you are unsure what size tyre you have or your tyre is not listed please contact RoughTrax by email info@roughtrax4x4.com or telephone +44(0)117 986 9065 and we will be happy to assist you with any tyre queries you may have. The law on tyres in the UK is comprehensive for good reason. Tyres ultimately mean safety. Driving with worn or damaged tyres drastically increases the risk of an accident. You could face a steep fine and 3 points per tyre on your driving license if you drive with damaged or worn tyres. The legal limit of a tread depth for your tyre is 1.6 mm around the whole tyre. Checking the tread depth is easy, many tyres have tread wear indicators. These indicators are small raised areas at the bottom of the grooves. If the surface of the tread rubber is level with these raised areas then the tyre depth is most likely very close to the legal limit, or below it! You can also use a 20p coin to measure tread depth. Simply insert a 20p coin into the lowest tread depth of your tyres. If you can see the outer rim of the coin, your tyre depth is less than 3mm and you should consider replacing that tyre. Specialist tyre depth gauges are also widely available from most car shops, so you can ensure you keep on the right side of the law and more importantly, you can keep safe!